Rabbi Menachem Froman of Tekoa meets PA President Abbas, tells him that establishing a Palestinian state would benefit peace. One of the leading rabbis in Judea and Samaria on Wednesday expressed his support of the Palestinian Authority’s unilateral bid for statehood in the United Nations on September 20. 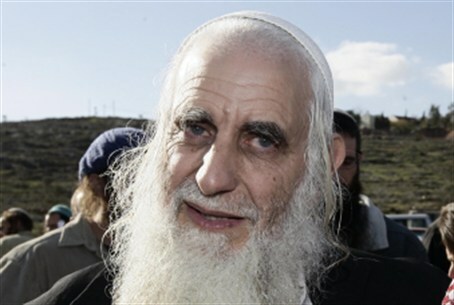 According to a report in the PA-based WAFA news agency, Rabbi Menachem Froman of Tekoa supported and expressed his and other Israeli rabbis’ wishes for success to the PA bid to gain full United Nations membership of a Palestinian state. The report said Rabbi Froman made the comments during a meeting with PA President Mahmoud Abbas in Ramallah. Arutz Sheva Hebrew site spoke to the Rabbi, who said the report was accurate. Froman said that establishing a Palestinian state benefits the peace process and Israel and also works to achieve comprehensive, just peace and stability for the region and the world. For his part, Abbas reiterated his commitment to the peace process with Israel and claimed that the PA’s statehood bid is a result of Israel’s refusal to abide by international law and agreements. WAFA said Rabbi Froman congratulated Abbas on the occasion of Eid al-Fitr, the Islamic holiday which marks the end of Ramadan. Rabbi Froman also reportedly offered to establish a committee made up of both Arab and Israeli religious figures to stop mutual instigation. “Establishing a Palestinian state in cooperation with the State of Israel is good for peace and for Israel and it will inspire the building of a just and lasting peace and stability in the region and the world,” Rabbi Froman was quoted as saying. Meanwhile on Wednesday, Israel’s Ambassador to the United States Michael Oren said the PA statehood bid would likely jeopardize all existing agreements between the PA and Israel. In an interview with Foreign Policy magazine, Oren said the move would render invalid economic treaties, including export, import and water sharing, as well as security cooperation agreements. Finance Minister Yuval Steinitz said Wednesday the statehood bid at the United Nations is a greater threat to Israel than terrorism. “This Palestinian initiative represents a more serious threat than that posed by Hamas,” Steinitz told Voice of Israel radio.